For many years, I have used the tarot as a way of processing life experiences and to gain insights into my psyche. It was a part of my upbringing--with a great-aunt who read tea-leaves and a family where the cards came out at holidays and were used as conversation-starters and narrative devices. In college, my roommates would come to me and we'd crowd around the kitchen table and I'd throw the cards for them about love, work, and their hopes for the future. We connected in this way and were able to share experiences we may not have otherwise. This has continued, and I've been reading for friends and family members for over two decades. Whether or not one "believes in" the tarot as a divination tool, it is rich in history, symbolism, and narrative. 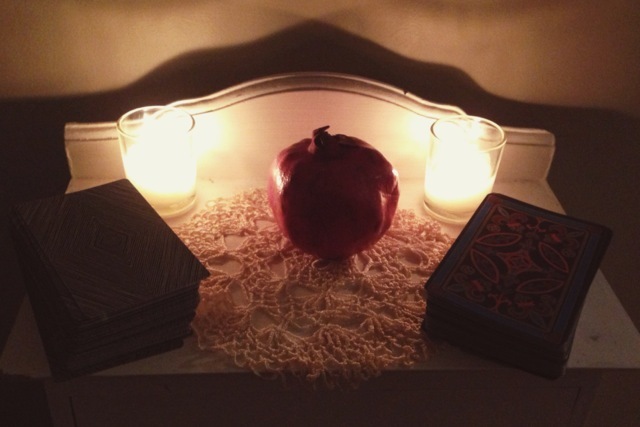 Tarot has been a part of my daily routines for as long as I can remember. Now, several opportunities have opened up for me to offer my tarot readings for larger groups in person. If you are interested in having me come read for your group or at your event, please see my About and Contact page and reach out for availability. I do not currently have any public tarot events on the books as of June 2018, while I focus on completing my novel, but I am still open to reading sessions for small parties and groups. In addition, private readings in-person and virtually are welcome. Fees vary depending upon the complexity of the reading, but I am happy to work with anyone who would like a reading--sliding scale and other opportunities available. Please contact me for more information!